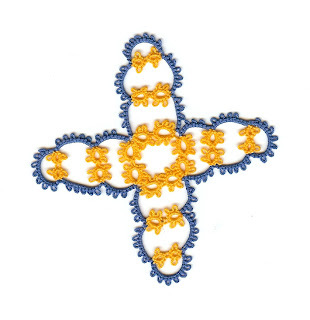 Here is the second version on the Large Star of Four Points from the 1912 Emmanuel Bocher Tatting Book. I am going to do one more version in front/back side tatting. I have never done front/back side tatting so it may be a test of my tatting skills. I think Sadie has settled into my new routine. She was not nearly as hyper last night as she has been and today she is very calm for her. She has been out a lot today but now is in under my feet or trying to chew on them. Good for you for trying frontside/backside tatting. It definately takes more thought, doesn't it?